Are you having trouble converting visitors on your landing pages? It’s possible your call-to-action could be the true cause of your conversion rate problems. A strong call-to-action (CTA) is crucial to your landing page and will be instrumental to your company’s success. One small CTA mistake, on the other hand, could lose you a potential lead in seconds. Keep reading to discover the 7 call-to-action mistakes responsible for your slumping conversion rate. 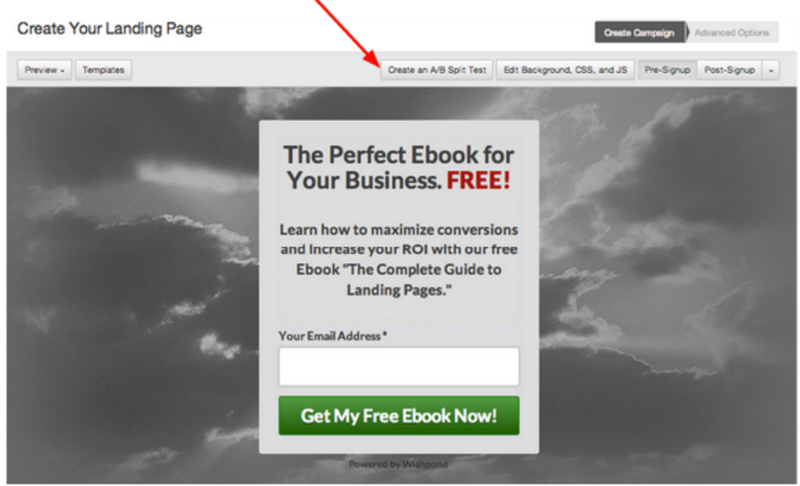 When a potential lead arrives on your landing page, your CTA button should instantly stand out. There are various ways to make your CTA attract attention including contrasting colors and whitespace. 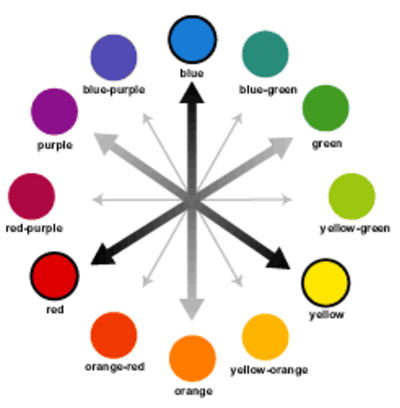 Companies often make the mistake of using a consistent color pattern throughout their landing page. This causes all of the various elements to blend together, and your CTA to be lost in the background. 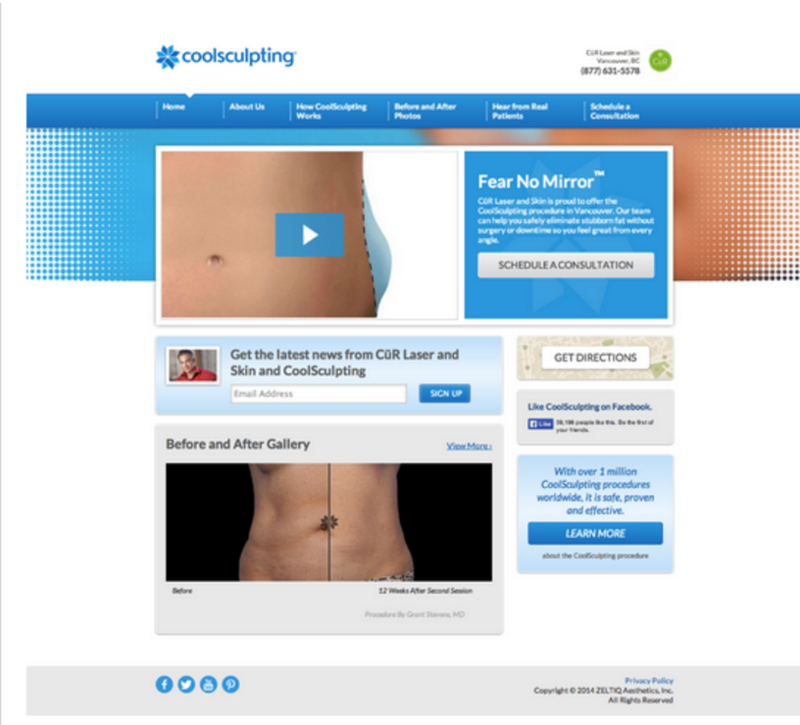 The landing page below is an example of a company that used blue throughout their whole page. Note how the CTA buttons “Schedule a Consultation” and “Learn More,” don’t automatically grab your attention. You should experiment with colors like orange, green, and red that will make your CTA obviously stand out. Ensure that your CTA button demands attention as a main feature on the page to help you maximize conversions. Whitespace is another tool you can use to prevent your CTA from blending in with other elements on the page. Whitespace is blank space used strategically to make certain areas of your page stand out. 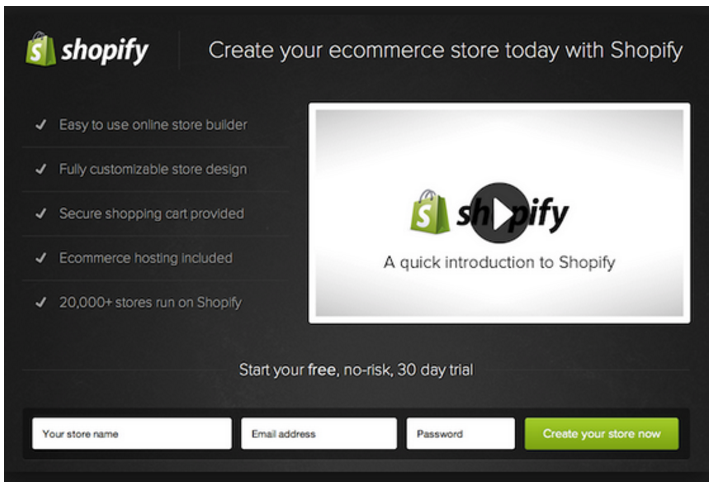 A great example of using whitespace to emphasize your CTA button can be seen in the landing page below. The size of your landing page’s CTA button is crucial. Companies often make the mistake of having a small CTA button to avoid coming across as too aggressive or pushy. But, your CTA button needs to stand out as it’s arguably the most important feature on your page. It’s easy for potential leads to convert when there’s a large CTA button that’s impossible to overlook. 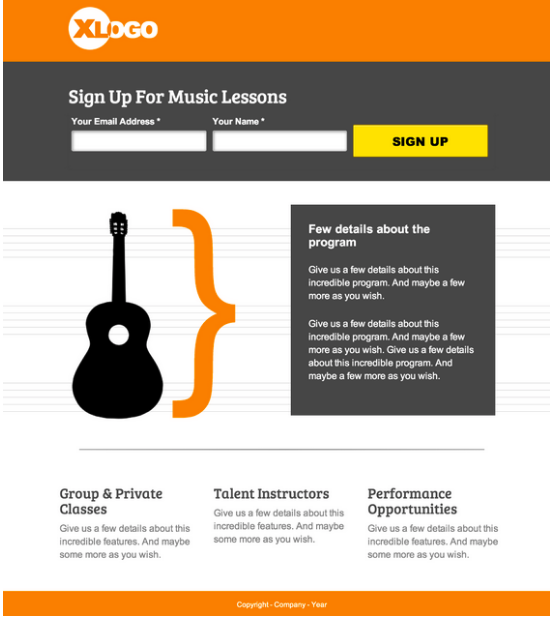 An example of a landing page with a very small CTA button can be seen below. The company used a contrasting bright green for the “Buy Now” CTA button, but it’s so small that it could be easily be missed. If it were a larger, more obvious feature, the company would find it easier to get conversions. A larger CTA is also easier to read and allows for more descriptive button text. With that being said, you don’t want the button to be so large that potential leads feel pressured to convert. Your button must be large enough to be noticed, but still small enough to appear modest and clickable; a bigger button doesn’t automatically mean more conversions. The change in the CTA buttons below actually led to a 10%decrease in conversions. 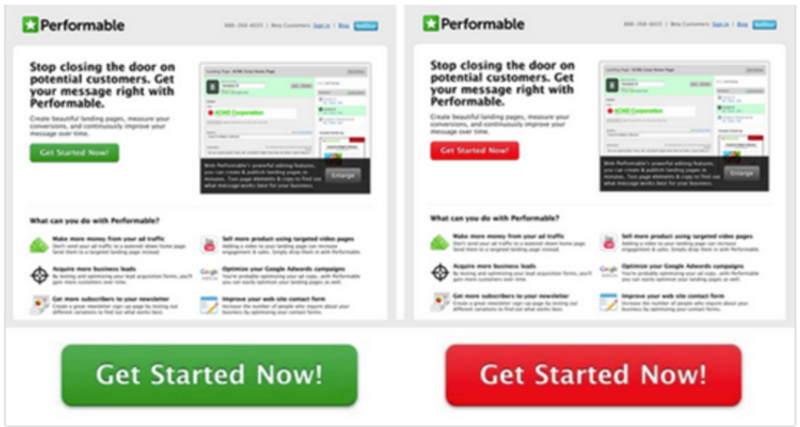 The best way to test your CTA button size is through simple A/B testing. This ensures you have the right size for your page layout and your audience. The last thing you want is for potential leads to be confused by button text like “Click Here” or “Submit.” This doesn’t tell them what will happen if they decide to click the button. Some studies actually show that landing pages with “Submit” as their CTA button text see lower conversion rates than other text. Button text needs to be authoritative and clear to tell potential leads the next action to take. The text must also clearly communicate how visitors will benefit from your product or service and what exactly is in it for them. Think of it as an action statement starting with the phrase “I want to…” For example, I want to… “Download my ebook now,” or I want to… “Start my free trial.” If you don’t tell them what they’ll get by clicking, your conversion rate is going to suffer. Your CTA text should be attention grabbing and easy enough to understand in a couple of seconds. You can grab visitors’ attention with keywords like “Free,” “Now,” “My,” or “Instantly.” These words trigger emotions and make potential leads more inclined to click on your button. Creating a sense of urgency by expressing a limited-time offer or a discount with immediate purchase, can also boost conversions. 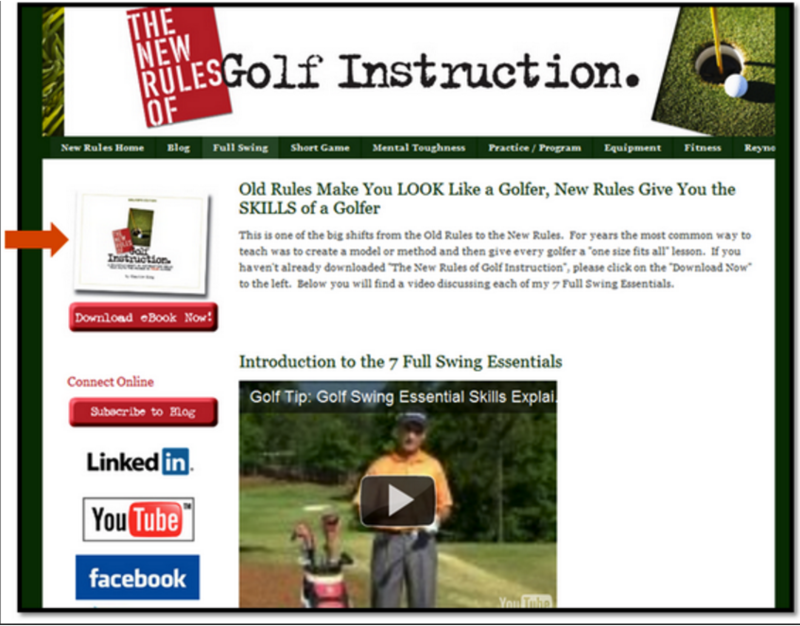 Button text such as “Shop now” or “Download my copy today” can prompt customers to act quickly. The language of your CTA has a large impact on conversion, so leave little to a potential lead’s imagination with clear, persuasive text. Marketers often make the mistake of placing the CTA at the bottom of the page or hidden among other elements. If potential leads have to search to find your CTA, they’re likely going to leave your page before converting. Make it easy for them to convert and place your button somewhere where it can’t be overlooked. Place your CTA “above the fold” of the page to catch viewers’ eyes. “Above the fold” means positioning your CTA so that it’s visible to potential leads without scrolling down. The standard location for a CTA is on the right-hand side of the page above the fold. It has actually been proven that CTAs on the right side of the page receive more clicks than those on the left. The Wishpond free landing page template below is a perfect example. The CTA button is at eye level, on the right side of the page and is obvious without the viewer having to scroll down. If you have a long landing page, there are other CTA options you can utilize to get your button noticed. One option is to include a scrolling CTA that moves with the visitor as they move down your page. This encourages clicks as the visitor can convert any time they’re convinced to take action. With a long page you can also consider having one CTA above the fold on the right, and another at the bottom of your page. This way, potential leads know the focus of your page immediately, but can still read through and convert when they reach the bottom (without having to scroll back up). The point of having a CTA on your page is to give page visitors a single action to take. It’s crucial that you give potential leads one path to follow to conversion, so that you don’t lose them along the way. Companies often insert too many messages, steering potential leads in all directions, rather than helping them to conversion. An example of multiple CTAs can be seen in the landing page below. On this page, visitors are asked to download an ebook, subscribe to a blog, follow the business of social media and watch a video. It is unclear what the conversion goal of this page actually is. If the goal is to get ebook downloads, that should be the only CTA button on the page. It’s okay to have multiple CTA buttons on the page if they’re all working towards the same conversion goal. 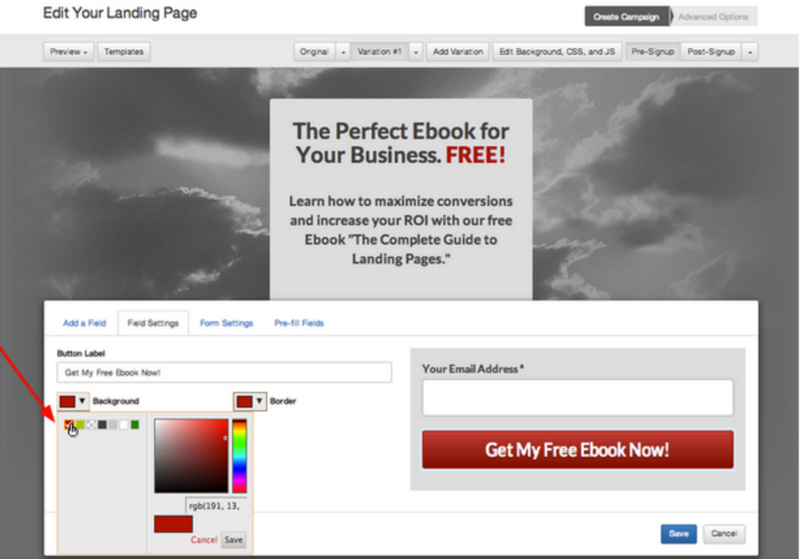 For example, a long landing page may have a CTA button on the right above the fold stating “Download my ebook now” as well as a picture of the ebook at the bottom of the page with a button stating “Get it now!” The key is that they have the same call-to-action. Asking visitors to complete multiple actions can lead to a decrease in conversions. Always have one goal for your landing page, and one goal only. It’s important that the message of your landing page is consistent from top to bottom. When a potential lead first reads your headline they should have a general idea of what your page is about. It’s good practice to use similar language in your CTA and heading to create a clear, cohesive message. If you do this, visitors will know what you’re trying to convey, resulting in a positive page experience. When potential leads understand your offer, there should be no uncertainty or confusion. How do you know if your CTA is the real cause of your falling conversion rate? 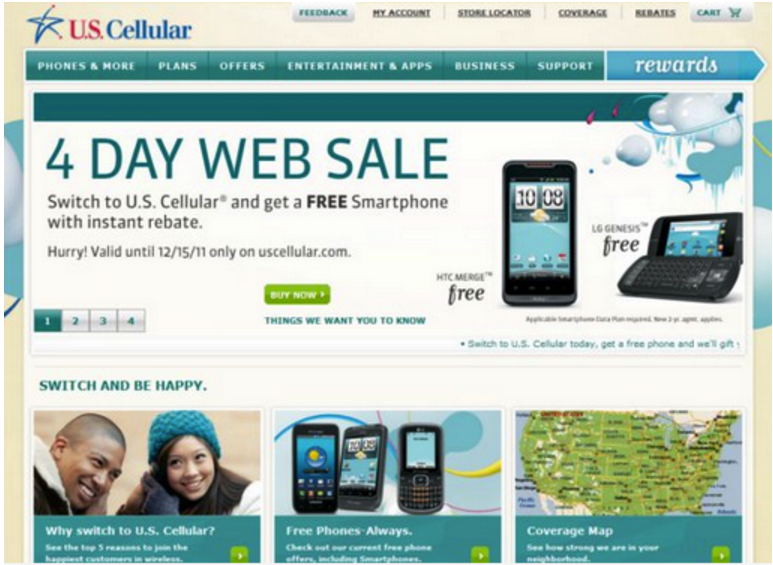 Failure to do A/B testing with your CTA may be the cause of many of your conversion problems. Having an appealing and classy, yet commanding CTA is the best thing you can do for your page, your conversion rate, and your company. But how do you know your CTA is doing its job if you aren’t consistently testing it with new variations? A/B testing involves changing one element of your page, and testing the new variation of your page against the original. By altering your CTA’s text, color, font, and location, you can determine the perfect CTA button to maximize conversions. Inside the Wishpond Landing Page Editor, you can create an A/B test by clicking the “Create an A/B Split Test in the toolbar at the top (see below). Once you have altered your CTA, your A/B test is ready to go live. Each time a visitor arrives on your landing page, they will randomly be directed to either the original or variation #1. When you publish your landing page, you will be able to analyze the results of each variation in real-time in the Campaign Report. In this example, we can see that variation #1 saw a 158.1% improvement in conversions from the original. We can clearly tell that variation #1 has won this A/B test, in which case we will select it as our winner. This will direct all future traffic of this landing page to variation #1. 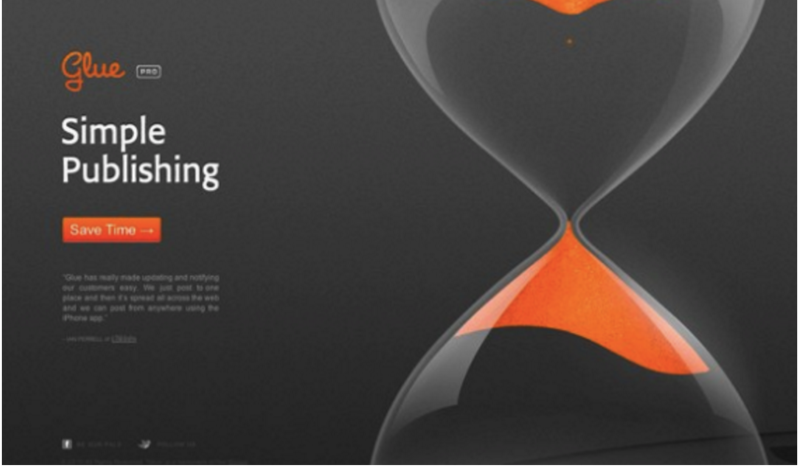 Time and again, marketers A/B test simple CTA variations and see massive changes in their conversion and click-through rates. If you aren’t already testing your CTA on a regular basis, you’re a step behind. An example of a simple change to a CTA button can be seen in the example below. This company changed their button color from green to red, resulting in a 21%increase in conversions. 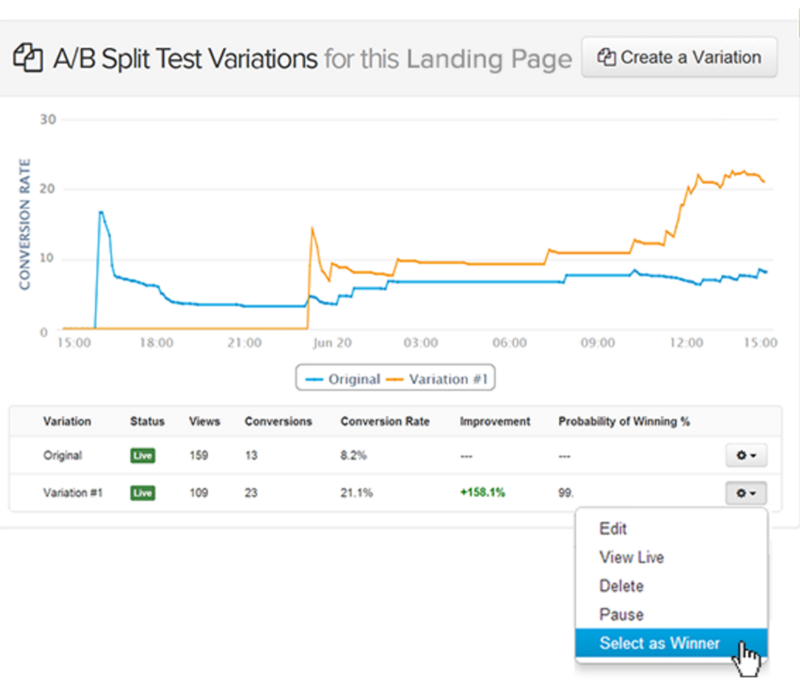 This proves how a simple A/B test can change your conversion rate instantly! Your CTA is one of the most important aspects of your landing page, and needs your time and dedication to do its job properly. Some of these mistakes may seem obvious, but you’d be surprised at the number of underperforming CTAs on the web. By reading this article you’re now well-educated with exactly what CTA mistakes not to make. Avoiding these errors will lead your CTA to be the real hero of your landing page. Any thoughts or suggestions of your own? Join in on the discussion below! Ready to get started optimizing your website's sales funnel with CTAs, landing pages and A/B testing? Check out Wishpond's 14 Day Free Trial today!